God goes to great lengths to rescue lost and hurting people, and that is what The Story is all about: the story of the Bible, God's great love affair with humanity. 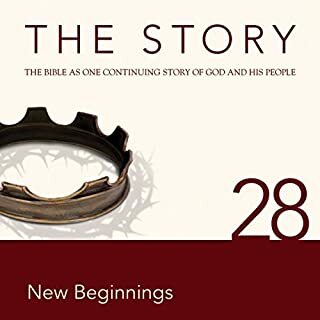 Filled with intrigue, drama, conflict, and redemption, this dramatized audio download of Chapter 28 - "New Beginnings" from The Story, NIV sweeps you into the stories, poems, and teachings of the Bible. God goes to great lengths to rescue lost and hurting people, and that is what The Story is all about: the story of the Bible, God's great love affair with humanity. Filled with intrigue, drama, conflict, and redemption, this dramatized audio download of Chapter 29 - Paul's Mission from The Story, NIV sweeps you into the stories, poems, and teachings of the Bible. God goes to great lengths to rescue lost and hurting people, and that is what The Story is all about: the story of the Bible, God's great love affair with humanity. Filled with intrigue, drama, conflict, and redemption, this dramatized audio download of Chapter 27 - "The Resurrection" from The Story, NIV sweeps you into the stories, poems, and teachings of the Bible. God goes to great lengths to rescue lost and hurting people, and that is what The Story is all about: the story of the Bible, God's great love affair with humanity. Filled with intrigue, drama, conflict, and redemption, this dramatized audio download of Chapter 26 - "The Hour of Darkness", NIV, sweeps you into the stories, poems, and teachings of the Bible. God goes to great lengths to rescue lost and hurting people, and that is what The Story is all about: the story of the Bible, God's great love affair with humanity. Filled with intrigue, drama, conflict, and redemption, this dramatized audio download of Chapter 31 - "The End of Time" from The Story, NIV sweeps you into the stories, poems, and teachings of the Bible. God goes to great lengths to rescue lost and hurting people, and that is what The Story is all about: the story of the Bible, God's great love affair with humanity. Filled with intrigue, drama, conflict, and redemption, this dramatized audio download of Chapter 21 --- Rebuilding the Walls from The Story, NIV sweeps you into the stories, poems, and teachings of the Bible. God goes to great lengths to rescue lost and hurting people, and that is what The Story is all about: the story of the Bible, God's great love affair with humanity. Filled with intrigue, drama, conflict, and redemption, this dramatized audio download of Chapter 2 --- God Builds a Nation from The Story, NIV sweeps you into the stories, poems, and teachings of the Bible. God goes to great lengths to rescue lost and hurting people, and that is what The Story is all about: the story of the Bible, God's great love affair with humanity. Filled with intrigue, drama, conflict, and redemption, this dramatized audio download of Chapter 25 - "Jesus, the Son of God" from The Story, NIV sweeps you into the stories, poems, and teachings of the Bible. God goes to great lengths to rescue lost and hurting people, and that is what The Story is all about: the story of the Bible, God's great love affair with humanity. Filled with intrigue, drama, conflict, and redemption, this dramatized audio of Chapter 15 - "God's Messengers" from The Story, NIV sweeps you into the stories, poems, and teachings of the Bible. God goes to great lengths to rescue lost and hurting people, and that is what The Story is all about: the story of the Bible, God's great love affair with humanity. Filled with intrigue, drama, conflict, and redemption, this dramatized audio download of Chapter 22 - "The Birth of a King" from The Story, NIV sweeps you into the stories, poems, and teachings of the Bible. God goes to great lengths to rescue lost and hurting people, and that is what The Story is all about: the story of the Bible, God’s great love affair with humanity. Filled with intrigue, drama, conflict, and redemption, this dramatized audio of Chapter 20 — "The Queen of Beauty and Courage" from The Story, NIV sweeps you into the stories, poems, and teachings of the Bible. God goes to great lengths to rescue lost and hurting people, and that is what The Story is all about: the story of the Bible, God's great love affair with humanity. Filled with intrigue, drama, conflict, and redemption, this dramatized audio download of Chapter 23 - "Jesus' Ministry Begins" from The Story, NIV sweeps you into the stories, poems, and teachings of the Bible. The greatest story ever told is more than just a cliche. New International Version (NIV) Bible text, with short transitions to connect the reader to the continuing story.